Then I recalled something told to all writers – stick to what you know. Now that’s not to say I can’t do intelligent, compelling insight, but I have a whole other part of my life, called work, which requires that. My greatest skill is daydreaming. Sometimes grandiose and outrageous, sometimes of a smaller and more possible nature – and I’ve decided to use my voice on this blog to torture you all with my notions. So today’s entry started out as a comment over in this post http://eyeofthefish.org/the-year-ahead/ and while I suggested in jest, I just thought I’d try it out. So I say Stop The Flyover! The premise is that we’re doing our transport plan exactly backwards. It has been based on the process of getting from Ngauranga Gorge to the Airport, hence the official name “Ngauranga to Wellington Airport Corridor Plan” (link to the pdf for those who feel like rereading it). So in the name of getting cars, people, trucks, goods, etc to the airport we have built the bypass, will build another terrace tunnel, build the basin flyover, build a second tunnel at mt. 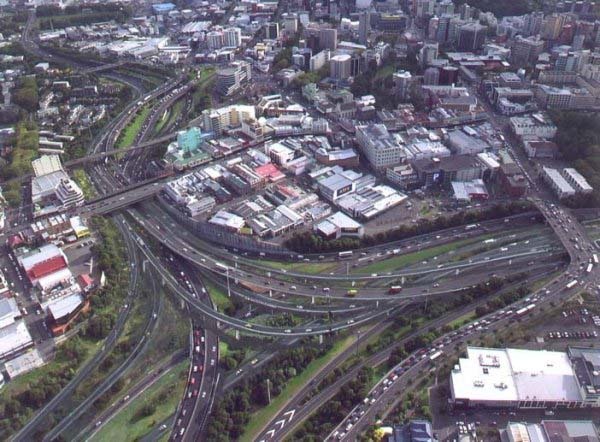 vic, and no doubt some point in the future – turning Ruahine drive into some divided highway/motorway. Now I know I’m not the first person to suggest that maybe, the airport is just in the damn wrong place. Only problem is where to put an airport in our hilly terrain. I’ve only been here going on 6 years, but i’ve read of plans linking a new airport out in the flatlands somewhere (wairarap or kapiti) with a high speed train. Certainly possible, but not an ideal situation I think. First the jobs and services that allow the airport to function would move out of the city, and only contribute to sprawl in new areas. 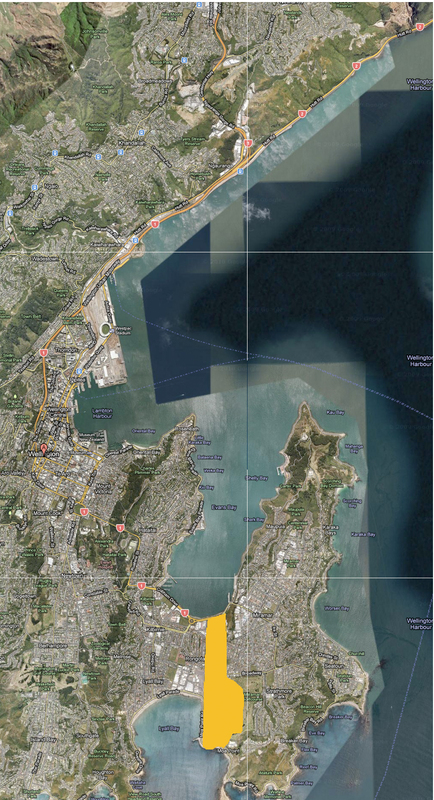 Of course the Wellington airport is where it is for a reason, it’s the only flat land in the immediate area. 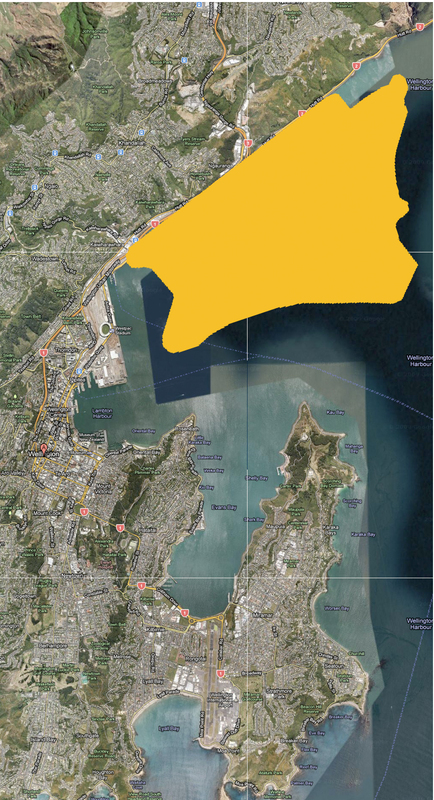 The Hutt valley once would have provided a nice flat bid of land for a large airport, but unless we’re willing to relocate tens of thousands of people to accommodate a larger airport (longer runways). And the need for a larger airport is real – a longer runway is necessary for the long haul flights, which if Wellington ever wants to have international flights to anywhere other than Australia and a few pacific islands, is necessary. Also, businesses increasingly make their decisions about locations about flight availability. A few years back Boeing moved its corporate headquarters from Seattle to Chicago. Boeing was the whole reason Seattle even existed as anything other than a backwater forestry town. The problem for Boeing was that Seattle’s airport was not conveniently located and with enough air service to allow their execs the ability to do business in a timely and competitive way. But, none of this really matters, because this is ultimately about daydreaming. So here is our dilemma. As the shape of the bays indicate, work has been done to accommodate some lengthening of the runways. And a bit of historical trivia for those of you who weren’t aware – the original airport in Rongotai had the runway running in the transverse direction. So we are in a better situation that we could be. So, this takes the existing size of the airport and through a few rotations and mirroring, places it into the side of the harbour, leaving an edge similar to waterloo quay. This would retain the access for the ferry and cruise ships. Now, since is the existing size of the airport, we may need to think a bit bigger. So I dutifully grabbed several airports from similar situations, ensure accuracy of scale and have tested them in the location. For comparison, this is what we would need if we were to be competitive with Auckland. Now, what you’ll notice is that just for placement I have used our relatively straight natural harbour edge (the fault line – which we’ll address/conveniently cover over later) for alignment with the reclaimed harbour edge. This is to show the relative size in the least obtrusive way, but obviously something of this would be arranged quite differently. So that’s great! 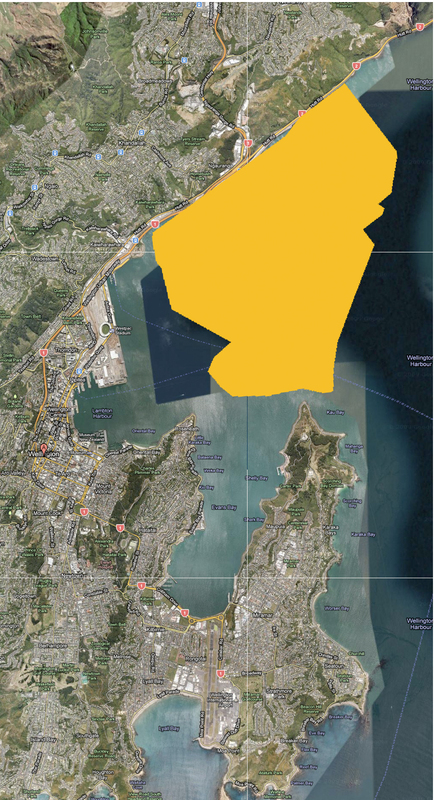 We could reclaim a bit of the harbour, and provide an airport that could rival auckland with the ability to cater to aircraft of all sizes. But what if that’s not enough? In this scenario we are still limited to one runway. There is no way you can be a global airport with just one runway. Let’s see what some of our air traffic competitors have done to solve this problem. Here is San Francisco airport, which has reclaimed the harbour several times (and it’s a very contentious issue). Interestingly, San Francisco’s situation parallels our own – squeezed in between motorway and the water. I do have a feeling that the passage between the point by Kau Bay (sorry I don’t know the name of the point) and the airport wouldn’t be passable for most of our larger ships. Here we get two runways, in a bit more compact shape, which may be due to the fact the site is 100% reclaimed land. With its shared similar topographical and transport problems, Hong Kong International Airport is an interesting case study for this daydream. So, using the Hong Kong model perhaps we could become a real international airline hub. But what if we wanted a THIRD? Here is Tokyo’s Haneda Airport which manages to get three runways into reclaimed are of the harbour. We’re not exactly leaving much of the Wellington side of the harbour, certainly not enough to be a working harbour and definitely not enough play space for us fishes. So to show some notion of reality, I acknowledge that Wellington is a one runway kind of town. Preferrably a longer one, so that we can take our long jaunts around the globe without transferring through Auckland. The light orange shows the basic size of a longer runway, terminal space and associated services (DHL, car rental, maintenance, private aviation, etc). The darker orange shows the potential for upgraded transport spine, compactly tying the train station, larger cruise ship terminal, ferry terminal, airport, and auto transport into one hub. Now in my incomplete and superficial addressing of the obvious faultline issue – Through staging of the reclamation with new airport construction, an upgraded seismic upgrades could be addressed so that we could get supplies into the city in the event of an earthquake. I say this with my years of experience as soils engineer specialising in seismic zones. So here’s the perfect solution. No need to build the flyover, or the two new tunnels. The only questions is what to do with the old airport and the existing new international terminal….. Totally infeasible. First look at the depth of water where you’re proposing. It’s seriously deep. Second, the north south orientation of our runway is precisely because our first prevailing wind is the northerly, the next is the southerly. Wellington aeroclub members often have to go to Blenheim or the Wairarapa to practice their cross wind landings because there’s not enough of them in Welly. Even though my property price in Maupuia would increase if the airport was moved, lengthening the runway to the south is the best option. Suggestions? You may want to look at the hillsides nearby in cross section – and the angle of descent for the current flight path. In a northerly, with your layout, you’d be fine as you fly in across the sea. But in a southerly, you’d have to have a hole bored through the hillside for the plane to fly through…. I second the orientation issue. The wind is enough of a problem at the moment without having it be a crosswind all the time. The only plausible new airport site will be somewhere out Kapiti way (which is getting to be more of a squeeze itself), and I don’t think it’d be economic without some other major motivating factor. Extending the current runway is inordinately expensive too, since it’s more reclamation and fairly deep – the actually-proposed extensions so far have been fairly short safety margins (i.e. no new planes) costing tens of millions. WIAL isn’t really interested in running more than a shopping mall anyway, so I can’t see a major extension happening unless the government does it. We’re probably stuck with what we’ve got. I’m very serious about a giant hole in the hillside. Very exciting ! The WIAL 2030 masterplan mentions the possibility of runway extensions of 100m for northern end and 500m for southern end. including a 525m long runway with a gradient of 18.5% in french alps. The extension of the Madeira airport runway looks interesting, I suspect something that would be explored for wellington if future extensions be needed. I’m not sure why reloacting the airport to the Hutt Valley was dismissed so quickly. I mean the relocation (away) of the Hutt Vallians and razing of the Westfield/Queensgate Mall can only be of benefit to the region can’t it? Alan #2, I can see your argument. And while razing westgate is certainly appealing, the current trends towards shopping mall/airports would make it seem better to just incorporate it. Take out a few of the shops and add jetways. If you used westgate as the terminal, I imagine you could get 3 run ways surrounding it pretty easily. DavidP- Now you’re talking! I would like to see some sketches of your proposal. Good point re Westgate being used as the terminal (it really only needs a few gates to complete the transformation). As for runways – the desolate wasteland that is currently known as High St is an obvious starting point. 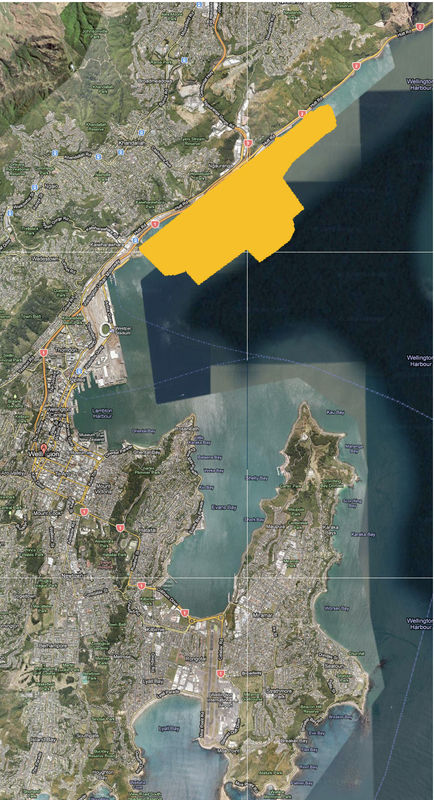 Another possibility could be Jackson St in Petone (which would also give the cross-wind alternative to keep the apparently influential Wellington Aero Club happy). Light rail between the two would complete the picture. Minimus… The other advantage of my proposal is that there will be no need to run the Eastbourne ferry any more. People will be able to get there using the new City to Eastbourne motorway with exits for the International Terminal, Domestic Terminal, and Somes Hill. There have been quite a few redevelopment projects in the US for old airports – Denver was the largest urban redevelopment project in US history. Austin, Texas had a similar one, when it built it’s new airport. But I’ve always found this redevelopment in Wyoming to be the most interesting. It’s outside a town called Casper, a town of about 50,000. This small suburb, of about 1000 was built on the old air field, and instead of tearing anything up they just used the runways and other tarmac surfaces as streets. Check out the satellite view. Ross Smith Ave in Darwin used to be the runway of the old airport. Ross Smith was the first bloke to fly from the UK to Australia and the old airport was his landing place in Australia. While Wellington Airport is no stranger to geotechnical engineering (the planes now land at right angles from where they used to pre-Depression), there is one point that you raise that could work rather well – the runway could be made from infill cut off from the adjacent hills running above SH2 between Ngauranga and Petone. Actually it’s been done before – what is now called Jarden Mile in Ngauranga area was cut out of the hillside and transported over the Hutt Rd (no motorway back then) over a Bailey Bridge by the NZ Army Engineers. Plenty of parking room for cars on the land between the current railtracks and the Hutt rd from Ngauranga to the Caltex too. Was just wondering, minimus, if you could turn your evidently abundant talents at photoshopping accurately scaled maps of world airports, into an overlay of bridges on to our harbour. How far would the Golden Gate bridge get to? Would it make it over to Eastbourne? What about the Verranzo Narrows bridge (assuming it did not flap in our wind…)? How big a bridge would we need to span across the harbour? yes master…. minimus can overlay bridges. Actually I like that idea a lot, sounds like fun. I was just sitting here trying to decide how to further procrastinate doing research I should be doing. Thanks! Actually I love projects like this. One year in archi school I had an urban design focused studio and to start out the lecturer had us each bring in a different urban space at the same scale so we could compare them. So someone brought in central park, someone brought in the national mall, and various other international urban spaces. I brought in the vegas strip as non urban place. It was crazy to see the scale in comparison. I can’t understand why you see this as a problem that needs solving. you know… for the same price as a new airport we could just build a 4 lane highway across the harbour from ngauranga to rosneath . that would bring the tourists flocking and bypass the downtown. you could even be more adventurous and add some cycle lanes on the bridge… mr key would love that. maximus>How far would the Golden Gate bridge get to? Would it make it over to Eastbourne? I’m not Minimus, but I think the narrowest crossing of the heads is about 1800m. That means a suspension bridge would be the second longest in the world (http://en.wikipedia.org/wiki/List_of_largest_suspension_bridges)… So it is buildable, but allowing Wellingtonians to visit a lighthouse easier might not rate with joining up Japanese islands or linking Denmark and Sweden in terms of business case viability. On the other hand, 1800m is nothing compared to the 32km length of the Afsluitdijk. That means my idea of damning and draining the harbour is almost trivially easy. In fact we’d be crazy not to do it. If we got all the water out before the Rugby World Cup then we could use the bottom as party central before we get started building the airport. Of course we’d need to disassemble the diving board down by the rowing club. If people are stupid enough to not notice that the roads are changed and step out in front of buses then there will certainly be people stupid enough that they won’t spot that the water has been replaced by an international airport. ah davidp you ruined my surprise! indeed the longest suspension bridge in the world (which actually there are several that are really really close to the same) would reach from seatoun to the other side of the harbour. The rest will be revealed later this evening or possibly tomorrow morning. 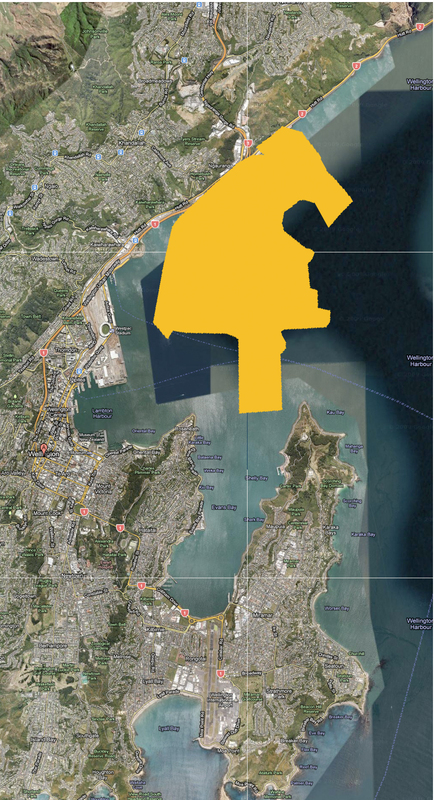 davidp – I’m disappointed that you think there is no reason to build to the other side of the harbour, just because there is no Denmark or Sweden there. Just think of the old chestnut : If we build it, they will come. I, for one, would welcome a chance to build a bridge over those (troubled) waters, and find a lost tribe of israel / denmark on the other side (oh, cliche ridden waters, don’t wait for me. Or, if I’m sinking, don’t weight for me…). Sorry for the craooy pic but it’s the only one I’ve got – with back to harbour looking at south end Jarden Mile over a Bailey Bridge that spans Hutt Rd. Think it’s from the early 70s but I’m having dinner tonight with the bloke who was in charge of the project so I’ll ask him then. Back to your photoshop fantasies, lads..